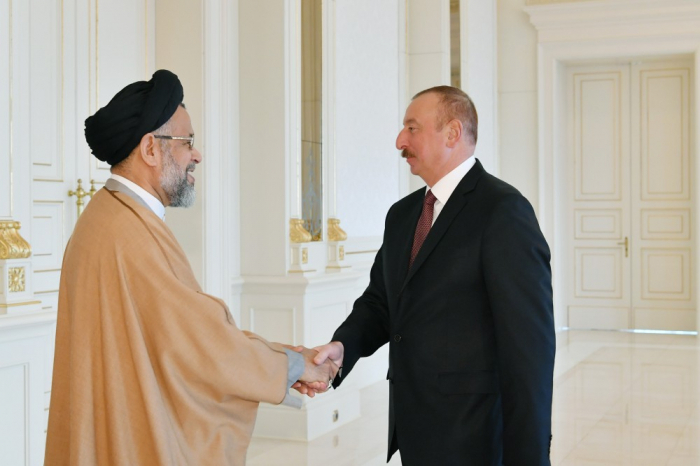 President of the Republic of Azerbaijan Ilham Aliyev has received Minister of Intelligence of the Islamic Republic of Iran Sayyid Mahmoud Alavi, AzVision.az reports. The Head of State said the Azerbaijani-Iranian relations were developing very successfully and today it is at a high level. President Ilham Aliyev recalled his visit to Iran and the Iranian President's visit to Azerbaijan and noted the importance of these visits in the strengthening of our relations. Noting that the relations between our peoples have deep roots, President Ilham Aliyev said that our relations are expanding today. The Head of State said that the documents signed between the countries were successfully implemented. President Ilham Aliyev expressed his confidence that the visit of the Minister of Intelligence of the Islamic Republic of Iran Sayyid Mahmoud Alavi will contribute to the development of our bilateral relations. Minister of Intelligence of the Islamic Republic of Iran Sayyid Mahmoud Alavi conveyed the warm greetings of the President of the Islamic Republic of Iran Hassan Rouhani to the Head of State. He said that President Hassan Rouhani sees the President of Azerbaijan as a brother. During the meeting, the sides exchanged views on the prospects of cooperation.